President Donald J. Trump lives a relatively unexamined life, and so, like many wealthy elites, he occasionally needs someone to do the service for him. In true Trumpian style, that duty came down to an Indian-American Muslim doing a job that no one else wanted to do, as host Hasan Minhaj joked in his opening remarks. Fully aware of his identity and its relevance to the absent subject of his monologue—the president was giving a stream-of-consciousness rally in Pennsylvania shortly before the soirée in D.C.—the Daily Show correspondent smacked around some identity politics softballs to warm up into his routine. Minhaj was unsparing of the president, taking full advantage of an opportunity that could launch him from relative obscurity to national recognition, similar to Stephen Colbert’s rise after the dinner in 2006. Following suit, Minhaj came out swinging. Interspersed among the Trump zingers were some wisecracks about the news media establishment. Minhaj also took on MSNBC and CNN for being hypocritical and sensationalistic, respectively. Then he took a swing at CNN. Of course, Minhaj couldn’t forget Fox News. 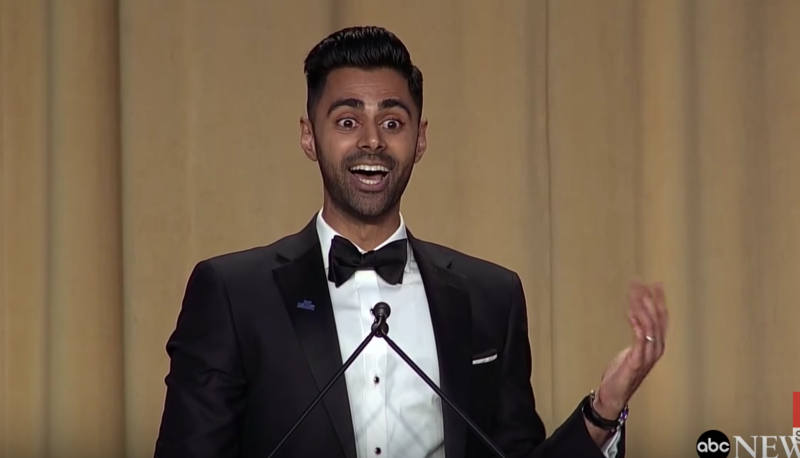 Ultimately, Minhaj performed well, and, while delivering a cathartic roast of Trump, he also held up a humorous mirror to the news industry that has been under more pressure and criticism than ever this year. Minhaj finished his monologue with a strong endorsement of free speech, supporting the value from college campuses to the White House. He showed gratitude to the press for the work they do, and emphasized that their job is more important now than ever. Yet, all the while, the man whose presidency was possibly launched by this very event was nowhere to be found, like a football captain afraid to lose the vote for prom king.